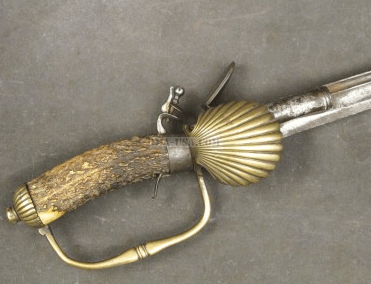 A FINE AMERICAN-MADE COLONIAL PERIOD BELT DAGGER/NAVAL DIRK WITH FACETED WOODEN GRIP, ca. 1770-1800: In overall fine untouched condition. The 12 1/2″, spear point blade: likely made from a recycled file. Retains a smooth gunmetal-gray age patina overall with a sharp point and a fine cutting edge. Single piece, dark-colored, carved and faceted, hardwood grip with smooth surfaces and some light handling marks: a fine iron pommel-cap and brass retaining-ferrule. Sheet-steel crossguard with simple decorative finials and lightly rust-stained and toned surfaces. In fine condition. The dagger blade with sharp contours and a fine spear-point. 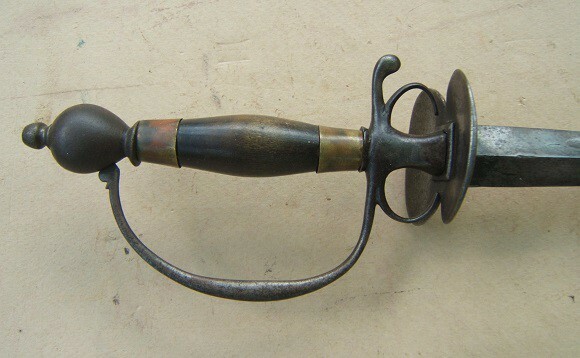 Fine grip with light signs of use and wear: fine tang-peen and untouched pommel-cap with rust-patinated surfaces. 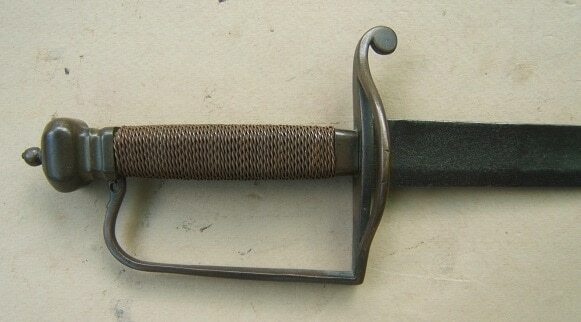 A very nice example of an American-made Naval Dirk/Belt Dagger, ca. 1770-1800. For a similar example, please see G. C. Neumann’s: “Swords & Blades of the American Revolution”. Overall length, 17″.